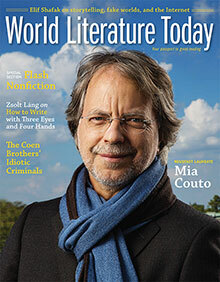 One of the most prominent writers in Portuguese-speaking Africa, Mia Couto was born in 1955 in Beira, Mozambique. Couto studied medicine and biology in Maputo and began his literary career during the struggle for Mozambique’s independence. The first Mozambican author to be nominated for and to win the Neustadt Prize, Couto has also received many other literary prizes, including the Prémio Vergílio Ferreira (1999), the Prémio União Latina de Literaturas Românicas (2007), and the Camões Prize for Literature (2013), a prestigious award given to Portuguese-language writers. In 1998 he was elected to the Brazilian Academy of Letters, the first African writer to receive this honor, and in 2003 he was decorated with the Order of St. James of the Sword in Portugal and the Order of Rio Branco in Brazil. The author or co-author of more than thirty books—including novels; story, essay, and verse collections; and children’s books—Couto has also worked as a journalist, biologist, and environmental consultant. His first novel and the novel that was the representative text for the Neustadt Prize, Terra sonâmbula (Eng. Sleepwalking Land, 2006), was published in 1992 to great acclaim and is widely considered one of the best African books of the twentieth century. Couto’s works have been translated into more than twenty languages. In English, Confession of the Lioness (Farrar, Straus and Giroux) and Pensativities and Other Interinventions (Biblioasis) are both forthcoming in spring 2015.